To defrost a turkey, remove the packaging and giblets. Cover the bird loosely with clingfilm and leave in the fridge or a cool room. The turkey is defrosted when the main cavity is free from ice crystals. For a fresh turkey, remove the packaging and giblets and store in the fridge, covered. Remove an hour before you start preparing it. This recipe is for a medium turkey. With a larger or smaller bird, you may need slightly different quantities of the other ingredients. Wipe the turkey inside and out with kitchen paper. Press the stuffing under the skin at the neck end, pushing it towards the breast. Don't pack it too tightly as it will swell on cooking. Secure the flap of neck skin under the bird with a skewer. Don't put stuffing inside the bird: it may prevent it cooking through properly, leading to a risk of food poisoning. (Any leftover stuffing can be rolled into small balls, placed on a greased baking sheet and baked with the roast potatoes for their last 30 minutes while the turkey is resting). Tie together 3 sprigs of the thyme and place inside the turkey with a sprinkling of salt and pepper. Tie the legs together to help the turkey keep its shape. Weigh the stuffed turkey to calculate cooking time. Smear the butter over the turkey and season. Chop the remaining thyme and sprinkle over. 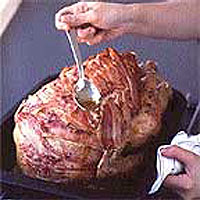 Drape the bacon on top. Put the turkey in a large roasting tin. Cover loosely with foil, ensuring there is space between the foil and turkey. Wrap the foil over the top of the tin to help keep the moisture in. Put on the lowest shelf of the oven. Cook for the calculated time, basting every 30 minutes. Remove the foil for the last 30 minutes so the turkey browns (put in the potatoes now). To test if the bird is cooked, insert a skewer into the thickest part of the thigh. If the juices run clear it is cooked. If not, cook for 15 minutes more and test again. Once cooked, transfer to a warmed serving plate. Cover with foil. Leave to rest for 30 minutes before carving. Meanwhile make the gravy.